Blueberries have the highest amount of antioxidants of all fruits. Blueberries have an anti-aging and anti-cancer effect. Ingredients: 100% organic wild blueberry juice. Good taste, happy there's no added sugar. No complaints. I love this juice. Very refreshing and I am reassured by the healthful contents. Blueberries! Great flavour and 100% blueberries, no water. 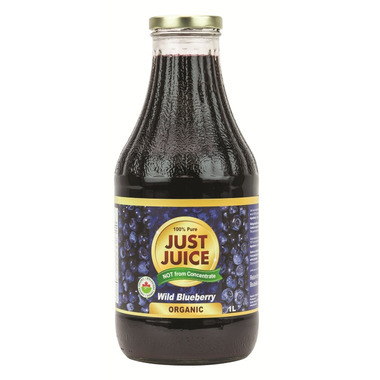 This is absolutely the best juice in every way; organic, NOT made from concentrate; no added sweeteners; just pure liquid blueberry. I will keep buying it. was disappointed in the taste. Amazing juice. Tasted smooth and sweet, but not too sweet. Pricey but you get what you pay for. Just Juice the best juice I've ever had, so pure, NO sugar, NO added water, which can be such a problem these days. I buy a lot of different varieties and love them all. In fact having some serious health problems they are part of my all liquid diet. 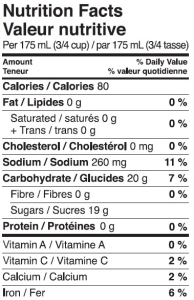 I commend well.ca for keeping such healthy items in stock, you guys may not know what a difference you are making, but here in rural Quebec you'd have to travel 80 miles round trip to go to a store that sells these type of organic products, and you are helping me get well. Thank you!!! great juice , this is how blueberry juice should taste , not some coloured water with loads of sugar . Just wish the price was a bit lower , geuss you have to pay to get the REAL thing . Will and have bought again , it's worth it .